Talk about an unlikely tandem: A former New People’s Army rebel and a former Army soldier are now in police custody for the killing of party-list Rep. Rodel Batocabe and his aide SPO2 Orlando Diaz. The former confessed he had acted as gunman while the latter drove the motorcycle used to get away after the congressman, who had announced his candidacy for mayor, was shot. Henry Yuson said he was hired by Daraga Mayor Carlwyn Baldo to kill Batocabe who was challenging him for the May 2019 local elections. The mayor, he said, promised the team P5 million and sustained livelihood for the job. Yuson’s statement’s corroborated that of a witness who had previously surfaced and said the plot to kill Batocabe had been hatched in August last year. Speaker Gloria Macapagal Arroyo commended the PNP for the swift progress of the investigation. We do, too. 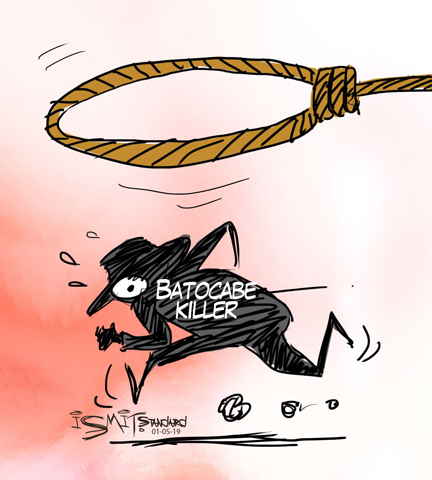 The slaying of Batocabe and his aide kicked off yet another season that promises to be chaotic and violent given the political climate at both the national and local level. That the people behind it have been identified and are being prosecuted sends a message that political violence is a tool for lowlifes who feel entitled to their government posts. They see these as positions of power rather than opportunities for genuine service. History has shown us that even cases that occasioned outrage—the Maguindanao Massacre, for example—are not necessarily resolved to their just end. Sadly and almost certainly, Batocabe’s case will not be the last. Between now and May, we will hear about more acts of violence perpetrated by people who believe they can get away with their crime. May today’s PNP be consistent in resolving these cases, whether they are high-profile or not. That we are no strangers to political violence does not in any way make the slayings right, or acceptable.